One Delta Chi fraternity member was killed and three others injured in a shooting at Northern Arizona University’s Flagstaff campus, university police confirmed. Police were called at 01:20 local time after gunfire was heard in a car park outside a dormitory on the campus in Flagstaff. Another shooting took place at a student complex near Texas Southern University, which left one person dead. President Barack Obama is due in Oregon on October 9 to meet victims of another deadly college shooting. Last week a gunman killed nine people at Umpqua Community College before taking his own life in a shootout with police. That tragedy has renewed the debate about the nation’s gun laws, an issue that sharply divides the country. The suspected gunman in the latest incident in Flagstaff is 18-year-old student Steven Jones, who surrendered to police. The university has identified the student who died as Colin Brough and it said the three students wounded are being treated at Flagstaff Medical Center. 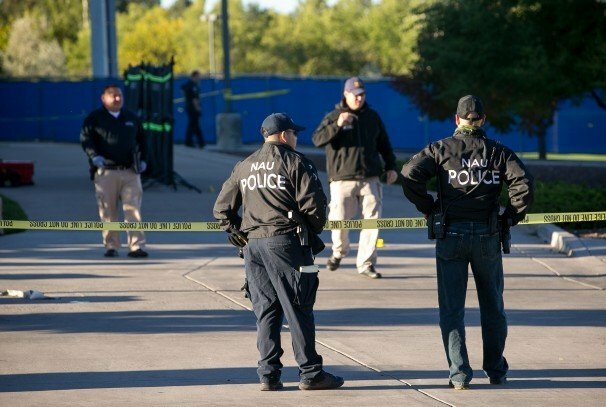 “This is not going to be a normal day at NAU,” said the school’s president, Rita Cheng. Representatives from the Delta Chi fraternity’s national organization said its members were involved in the confrontation but did not have information about the victims. The second shooting in Texas happened later on Friday morning at the University Courtyard Apartments on the edge of the Houston campus. Police said one person was killed and another arrested.